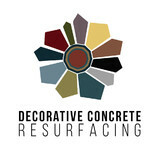 Decorative Concrete Resurfacing is a concrete contractor specializing in stamped concrete overlays, stained concrete, concrete refinishing & resurfacing, restoration and many other decorative concrete applications since 1983. For over 34 years, we have expertly met the decorative and utilitarian needs of our clients because we value their satisfaction. We employ a crew of fully qualified concrete technicians and design consultants who will build a project around your needs and ornamental ideas. Our company also works with commercial and business interests in the greater Saint Louis area. We strive to help you make the most positive first impression on your customers by providing concrete repair and upgrades outside and inside your business. Beyond patch and repair services, our quality decorative overlays can add a touch of class to your business, turning that routine space into a premier showplace. You can check out our reputation with the Better Business Bureau, or review the testimonials of our business and residential clientele included on this site. If you have plans of having concrete resurfacing done on pool decks or patios, or wish to upgrade your indoor or outdoor floor designs with stamped concrete, be it in a residential or commercial lot, we can provide you with an up-front estimate of time and cost when you call us today! 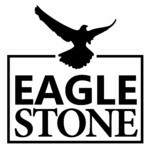 Eagle Stone & Brick, Inc.
Eagle Stone is family owned, and has been in the manufactured stone veneer business since 1993. Through the years, our company has transitioned from full production manufacturer to full service stocking distributor of all major brands of stone veneer and several other specialized brands, as well as installation materials. Our experience has created a family atmosphere amongst our team. Most of our staff has been here since the beginning; even our “rookie” has been here for more than five years. We are confident that our knowledgeable staff will make your stone experience seamless. Our unmatched customer service is the foundation that keeps us growing. 25,000 square feet of warehouse space houses our 88+ stock items; the biggest selection in the area. Our intimate showroom displays all 88+ styles, textures and colors. With our one-on-one guidance, we’ll help you through the selection process. Eagle Stone’s regular hours are Mon-Fri 8:00am – 4:30pm. We can provide Saturday service by appointment. Our years of service in the stone industry have created an amazing dealer network. For additional convenience, we may have a dealer near you. Call us at 618-282-6722 to find out! We carry the following brands: Eldorado Stone - StoneCraft Industries - Cultured Stone Dutch Quality Stone - Paragon Stone - Coronado Stone With manufactured stone veneer, you achieve the look and feel of natural stone at a fraction of the cost. It is lightweight, durable, maintenance free, aesthetically appealing & easy to install. Additionally, Eagle Stone offers Custom Stone Engraving, Landscaping Products and Firepits! T & H Foundations specializes in pouring custom home Foundations along with residential flat work services. Whether you are pouring a foundation or a stamped concrete patio, we can provide you with the best value for your investment. Our success is lead by our attention to detail, clean and efficient job sites, communication with our customers throughout the project, and pride we have for each project. Architects, interior designers and homeowners alike have discovered that concrete is a creative, versatile and cost effective way to add beauty to any renovation or construction project. From patios, driveways, and pool decks to garage floors, basement floors, sitting walls and fire pits, we customize each project to your unique style and specifications. With staining, stamping, resurfacing and epoxy flooring, CustomCrete can change any concrete surface in your home into a work of art. Call us to discuss your project today at 636-278-2218. We can schedule an appointment to visit your site, discuss your options, as well as the CustomCrete process. Centurion Stone St. Louis is a family-run dealership of Centurion Stone serving the St. Louis and surrounding area for over 30 years. We are established in the community as a leader in the stone veneer industry. We supply products to both residential and commercial customers and take pride in offering the best prices in the area. Our large showroom has over 40 manufactured stone displays for you to browse and select your preferred pattern and color for your indoor or outdoor project. Moes Masonry offers commercial and residential Masonry services in the St Louis and surrounding areas. Our services include masonry, brick repair, tuckpointing, chimney repair, concrete, fireplaces, brick mailboxes, Glass Blocks, basement water damage, roofing, and more! Call us today at 314-255-8940 to schedule your estimate. St. Louis, Missouri based Concrete Company specializing in Decoritve Concrete, Concrete, Retaining Walls and Excavation. Mirelli Tuckpointing LLC is a family owned and operated business, which has been providing the Saint Louis area with exceptional masonry service for twenty seven years. We have a staff of dedicated, longtime employees who will exceed your expectations. We are committed to excellence, and each customer is our top priority. We provide a wide range of masonry services for both residential and commercial properties. 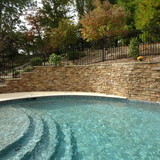 Fieldstone Products supplies and can install any type of natural stone or manufactured stone veneer. We have a premier showroom that features the finest displays in this area. Simply stated "We Rock". Being able to see larger displays and actual installed products is the key to exceeding our clients expectations. Not only do we showcase fireplaces but offer a variety of installation ideas and applications that will get your creativity going. We specialize in stone products, stone and stucco installations. "Do it Yourself-ers" and smaller contractors appreciate our desire to educate them on the installation process and offer them support on their projects. We feel our showroom is our best testament to our quality commitment. Masonmade Stone Design + Supply specializes in natural stone. We partner with architects, builders, contractors, as well as directly with homeowners and designers. Our mission is to supply the highest-quality natural stone so our clients can create extraordinary buildings and environments. We are a full-service stone distributor. Through our local showroom we provide one-to-one design consultations, sample stone displays, custom mock-ups and detailed shop drawings. Our team handles freight logistics and delivers material directly to your job site. We also fill orders from our centrally located stock yard. We source natural stone from more than 25 trusted quarries and fabricators across eight different countries. Our current stock selection includes limestone, bluestone, sandstone, granite, slate, quartzite, marble and travertine. Some of the most common residential and commercial applications include interior and exterior veneer and building stone - thin and full depth, custom cut and carved stone, patios, outdoor kitchens, walkways, step treads, pool decks, pool coping, fireplaces, fire pits, ovens, hearths/mantels, landscape walls, accents and boulders. You can view a variety of color, cut and finish examples at our design studio and sample showroom centrally located in St. Louis, MO. Call or come by to start planning your natural stone project. Our goal since starting in 2007 has been to take the time to help design your custom flatwork project and make it fit you and your homes personality. If drainage, retaining walls or re-grading of your yard is needed to make the new concrete functional, we let you know up front and can do the work required in house. All of our projects are brought to finish by back filling with top soil, placing seed and straw (no addition cost) around them so when we leave you don’t have any work to do. Kleeschulte Concrete is the premier concrete contractor serving the St. Louis Metro area with over 75 years of combined experience servicing the St. Louis, St. Charles, O’Fallon and St. Peters areas. Big and small, we have done them all. Whether your concrete needs include a new driveway, patio, sidewalk, porch or more, call us today to find out how we can help. Are you looking for something all the neighbors will be jealous of? Make sure you ask about our decorative concrete options including: stamped, stained, exposed aggregate and stained concrete choices. Kleeschulte Concrete provides a high-quality backed by unmatched service. A family owned company created over 15 years ago, Kleeschulte Concrete strives for perfection and your satisfaction. Our business depends on your referrals! We guarantee top notch work in a timely manner at a reasonable rate. From patios to driveways to walkways, every project and client is treated like family. Call today to set up your free estimate or simply click on the free estimate button above. Once you see our work you will be hooked. We are a local hardscape supply company. We offer a wide variety of concrete pavers, retaining wall blocks , natural stone, bulk material, drainage, lighting, decking, fencing, and much more. Our friendly staff would love to help you create the backyard of your dreams! From installing new exterior columns to repairing your chimney, masonry contractors can help you add both visual appeal and value to your property. They’ll know what kind of installation makes the most sense for your St Louis, MO climate and regional style. Looking for something that will develop a patina with time? Or would you rather have your home feel brand new for years to come? Choosing the right kind of stone involves thinking about the future, too. Experienced brick suppliers and stone suppliers can help you find the material that will work for your home now and for years to come. These professionals aren’t limited to exterior work either. Whether you want a split-stone granite wall in the kitchen or need help installing traditional brick masonry on your fireplace facade, you’ll want a professional to get it right. If you’re already working with an architect or designer, he or she may be able to suggest a good St Louis, MO subcontractor to help out. Here are some related professionals and vendors to complement the work of stone, pavers & concrete: Landscape Architects & Landscape Designers, Architects & Building Designers, Garden & Landscape Supplies, Driveways & Paving, Siding & Exteriors. Find stone, paver and concrete professionals on Houzz. Search the Houzz Professionals section for St Louis, MO stone, paver and concrete professionals. Browse photos and read reviews, and contact a pro if you like their work.